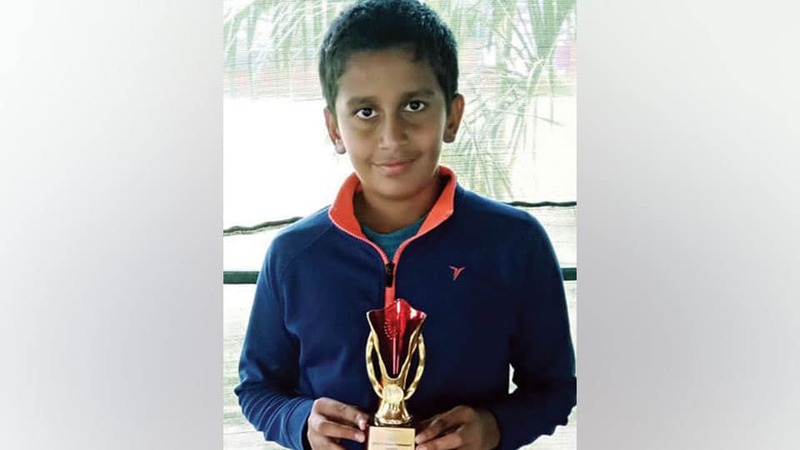 Recognising his consistent performances in AITA Tournaments where he now has 23 titles including 10 AITA U-10 wins, city’s young tennis player Mustafa M. Raja was awarded cash prize by Karnataka State Lawn Tennis Association (KSLTA) at KSLTA Stadium, Cubbon Park, Bengaluru, recently. Mustafa has won AITA U-12 tournaments in singles and doubles on numerous occasions as well. He has been one of the top players in his category for the last three years now and represents Karnataka at the National level tournaments. At age 11, he is among the top 13 in the country in the U-12 category and top three in the country in his age group (Born in and after 2007). Mustafa was awarded Rs.25,000. The cheque was received by Mustafa’s mother Farida Raja as Mustafa is currently training at Eagle Fustar Academy in Northern California, USA. He is on a five-week advanced training programme where he is attending High Performance Clinics. He is accompanied by his father Murtuza Raja. Mustafa is a student of Excel Public School and trains at Nagaraj Tennis Centre, Mysuru. KSLTA Hon. Joint Secretary P.R. Ramaswamy presented the cheque in the presence of other members.